Thunder Road racing legend and family patriarch Joey Laquerre of East Montpelier has been elected to the New England Auto Racing (NEAR) Hall of Fame’s Class of 2015. The 71-year-old Laquerre is the all-time winningest driver at Barre’s Thunder Road with 45 wins, including a record 17 in the Tiger Sportsmen and 14 in the Late Models. His most recent Thunder Road victory came in a Late Model feature on June 5, 2014. Laquerre was the 1982 “King of the Road” and also won five championships in the Mini Stock division between 1973 and 1980. 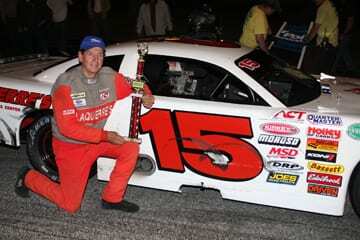 In addition, Laquerre was the winningest driver at the former Catamount Stadium in Milton. He currently owns and operates Speedway 51 in Groveton, NH. Laquerre joins former NASCAR Sprint Cup winner Greg Sacks, former road racer and commentator Sam Posey, Lee USA Speedway promoter Red MacDonald, late multi-time Super Modified champion Paul Dunigan, Coastal 181 publisher Lew Boyd, and late many-track champion Jim McCallum in the Hall of Fame Class of 2015. The NEAR Hall of Fame was established in 1997 by the New England Antique Racers. An induction banquet will be held Sunday, November 8 at Meneeley’s in South Windsor, CT.